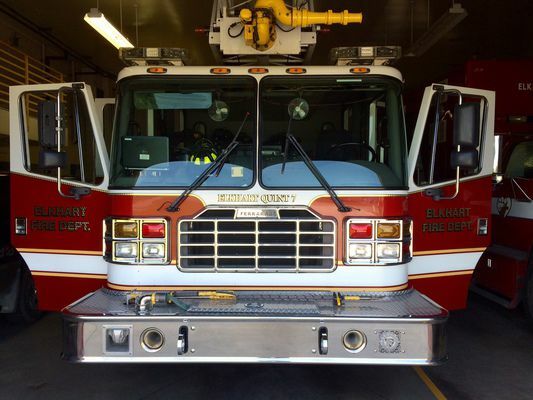 A fire at Ameriwood Industries in Dowagiac is believed to have started due to an explosion in the boiler feed auger system. That is the word from Dowagiac Fire Department officials. The blaze broke out around 5:30 p.m. on Sunday, Jan. 27, with smoke seen high over the downtown area. The fire caused damage to some door and walls. Several other fire departments were called to help douse the flames. At approximately 1732 hours on Sunday evening the 27th the Dowagiac Fire Department and Wayne Township Fire Department were dispatched to Ameriwood Industries at 202 Spaulding in Dowagiac for a commercial structure fire. As units were responding smoke was noted from the structure visible over the downtown area. A MABAS box alarm was requested and moved to a 2nd alarm which brought Indian Lake, Sister Lakes, Pokagon and Cassopolis fire departments. Arriving units were met with fire showing in the area of the boiler heating and sawdust hopper areas. Due to heavy fire conditions, noted structural damage and limited visibility in the large structure master streams were deployed from the aerial ladder, apparatus and ground systems. As conditions improved and the fire isolated crews moved into safe areas of the structure to locate and extinguish hot spots and extension. The fire was declared under control at about 2130 hours with crews remaining on scene until after midnight to extinguish smaller hot spots in the walls and roofing in the main fire area. The fire is believed to have started due to an explosion in the boiler feed auger system. This system feeds stored sawdust to a burner which is part of the boiler heating system. Damage to this area included large overhead doors and walls damaged from the explosion. Structural damage from the fire is still being assessed and the department will return to work with Ameriwood crews later today for follow up on the amount of total damage. Fire crews were supported by generous businesses and citizens who brought beverages and food to support the firefighters. True’s Towing brought a heated trailer for fire crews to warm up in. The outside temperature during the fire was around 9 degrees. No injuries have been reported as a result of this incident.